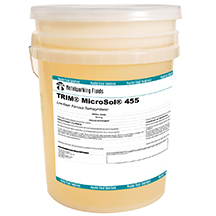 TRIM® MicroSol® 455 low-foam semisynthetic, microemulsion coolant is optimized for high-volume cast iron, ferrous, and some aluminum and nonferrous metalworking operations. MicroSol 455 prevents leaching of elemental iron and eliminates clinkering and oxidation of ferrous micro fines. Delivering extended sump life, machine-friendly MicroSol 455 provides excellent, cost-effective cooling. Make a difference to your bottom line with MicroSol 455.